Vinju, J.J, Hills, M.A, Klint, P, van der Ploeg, A, Izmaylova, A, & van der Storm, T. (2011). 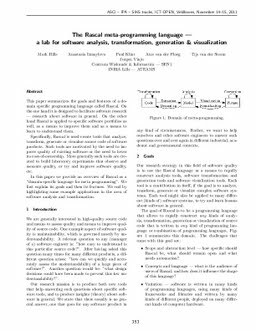 The Rascal meta-programming language - a lab for software analysis, transformation, generation & visualization. In Proceedings of ICT.Open 2011.